I am trying to use a survey tool to recommend a particular decision. In my case, I am using the Ten-Item Personality Inventory (TIPI; link here: https://gosling.psy.utexas.edu/wp-content/uploads/2014/09/JRP-03-tipi.pdf) and want to understand what a good binary or ternary cut off would be to recommend a choice. Should I use the mean score or 33% percentiles respectively or is there a better way to think about it? Also, more generally when taking a survey test, how do you recognize if you are "low," "average," or "high" on a particular measure? For instance, when you take a personality test and your results state you are low in neuroticism, where does that ordinal value come from? Lastly, it should be useful to note that from the research paper I linked, I don't yet know the mean values/percentiles, so if that is the right answer, using an example referencing the paper would be most beneficial to my problem. First, a minor point is that the TIPI is a very poor measure of individual-level personality. Two item measures of personality are rarely justifiable. Standard errors of measurement are unnecessarily large. In general, you are talking about the topic of norms and standardized scores. Any introductory book on psychological measurement will discuss topics related to standardised scores and norms. You need to define your target population. E.g., Just males? Just females? What ages? What country? etc. 2. 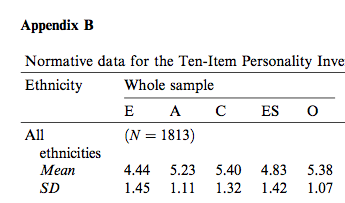 Obtain estimates of norms for that population. You then need to get a sample estimate of that population. In some cases, the test manual may provide this. In other cases, you can look to the published literature to see various normative samples. Note that these standardized scores are always contingent on your norm sample. There are also a range of more sophisticated approaches that are sometimes applied. For example, if you are doing cognitive testing in children, you can interpolate norms between ages, so for example, the norm for a 6.5 year old is different to a 6.8 year old. The definition of high and what scores are low, average, and high is somewhat arbitrary. You probably want to think about your application and what the consequences will be of these categorical designations. Assuming a normal distribution, about a sixth of the distribution would be the low category, and another sixth would be in the high category. If the distribution is not normal (e.g., you have floor or ceiling effects), then you may prefer percentiles for the full distributions or raw scores, but in cases of published articles, you probably wont have that. For extraversion where the mean is 4.44 and SD is 1.45, then you might have cut-offs of low < 2.99 < average < 5.89. Anyway, as noted above, the publication present several different norms by gender and race. You may even have your own norms that is more relevant to your context. Not the answer you're looking for? Browse other questions tagged measurement personality survey or ask your own question. Is there a term for a measure in which an extremely high or low score is considered bad?